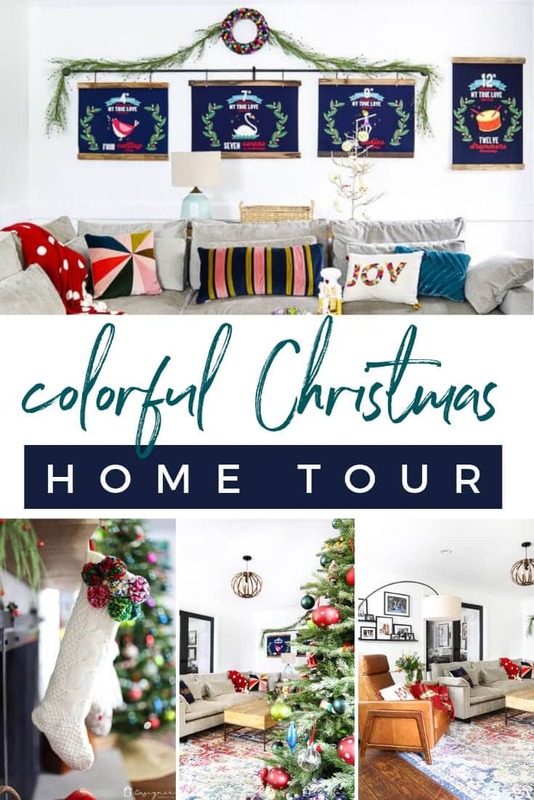 Come inside to take my Christmas home tour! 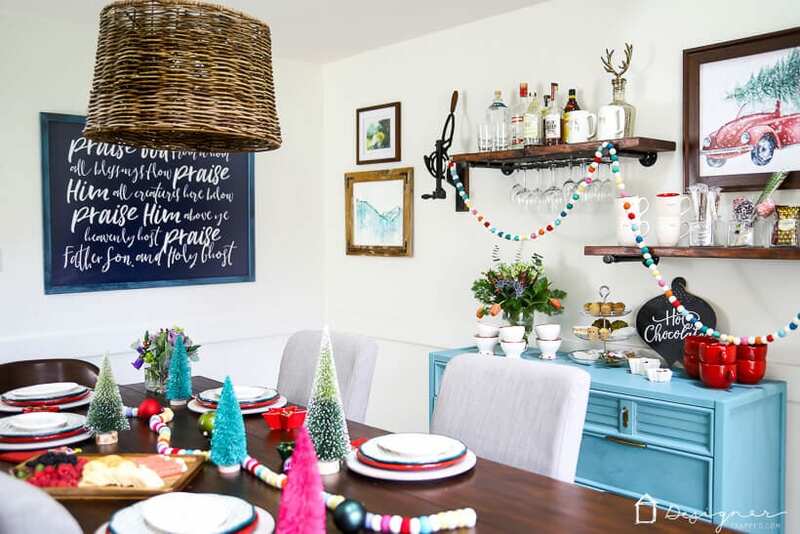 It's an eclectic mix of modern and traditional elements and it's full of colorful Christmas decor! Welcome, welcome, welcome! 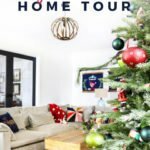 Today I'm sharing my 2018 Christmas home tour. 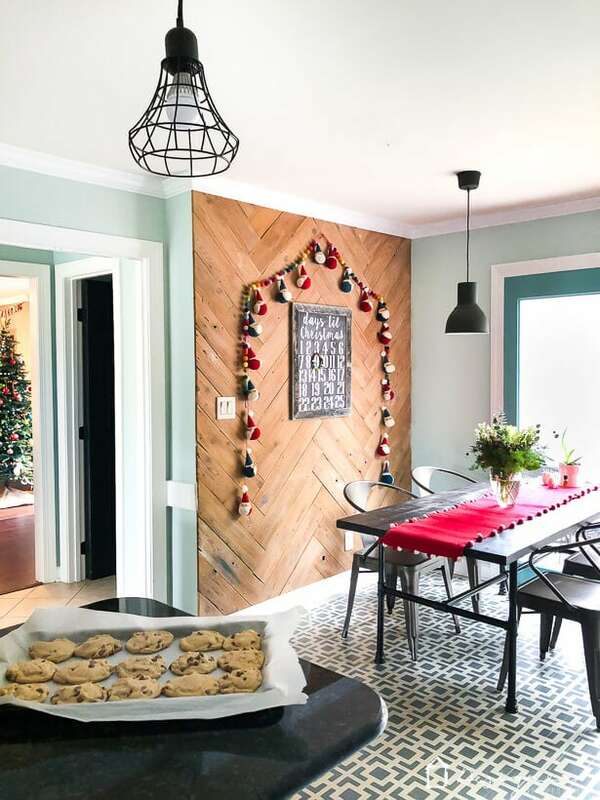 It's actually been several years since I've shared a Christmas home tour for a few reasons. The biggest reason is that I'm never really ready in time. 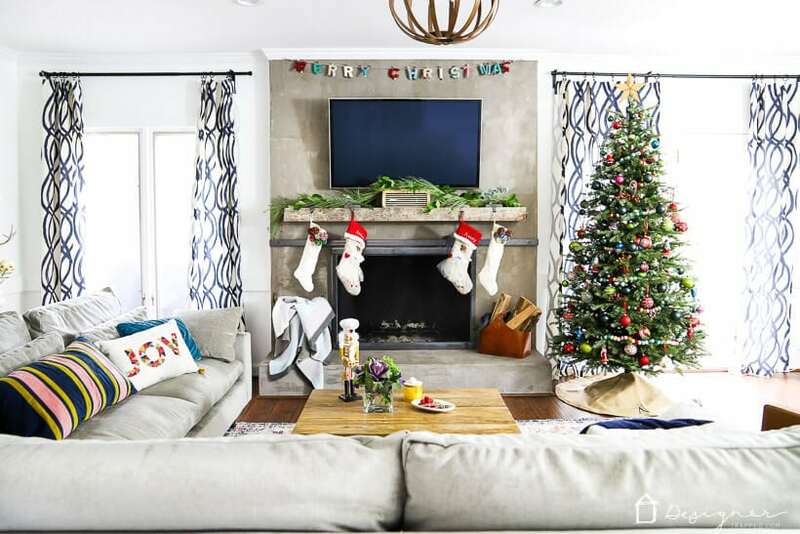 This is the first year we've ever decorated before Thanksgiving because we've always purchased a fresh tree and decorating sooner than that wasn't really an option because fresh trees only look good for so long. 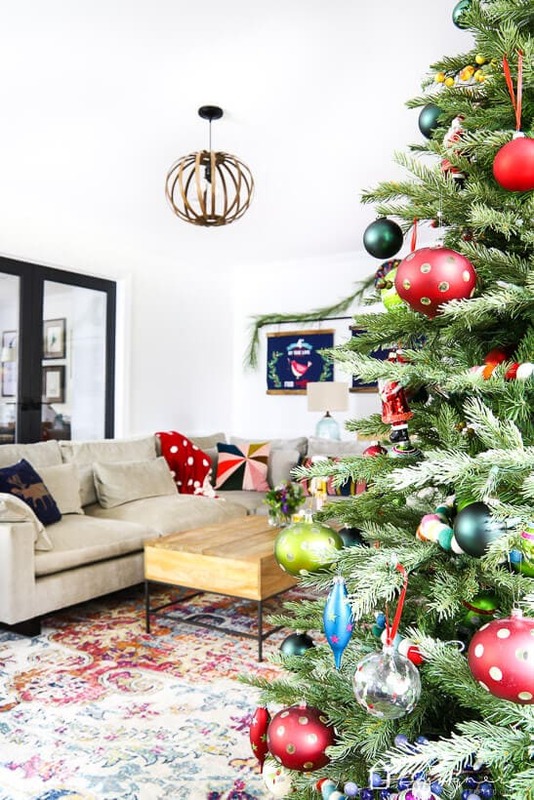 This year we purchased an artificial tree that we LOVE (and you may have already seen it if you checked out my colorful Christmas tree post last week). So, that made it possible for us to start early. I don't regret it! It's nice to be able to enjoy the decorations for so long. The other reason I haven't shared a Christmas home tour in a couple of years is that I just haven't been that excited about our Christmas decor. I'm such a lover of color in my home, but I realized our Christmas decor really wasn't very colorful, lol. It was very much red, white and green, so I didn't feel like I had anything exciting to share. Well, this year I decided to kick our Christmas colors up a notch and now I'm 100% in love with our Christmas decor. So with that said, let's get this tour started! 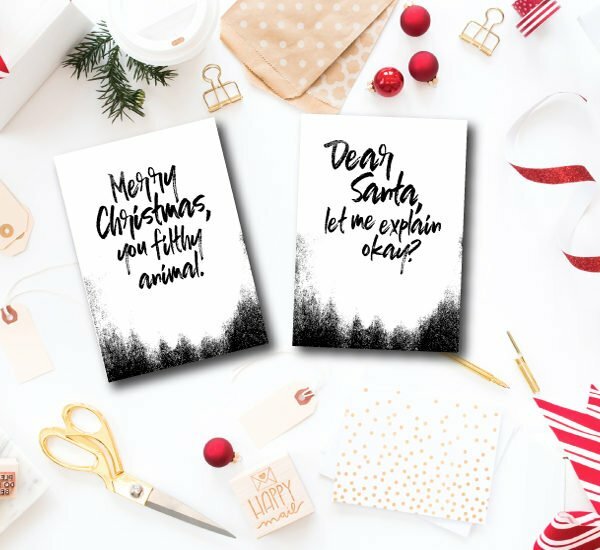 I've included links to Christmas decor you see in my photos whenever possible (but some of the stuff is old and not in stock anymore–sorry)! 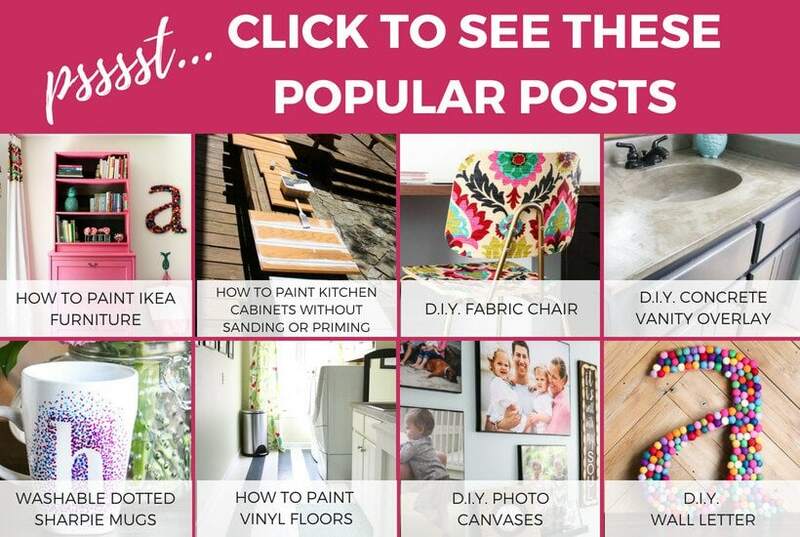 I've linked to similar items for some DIY projects and out of stock items for you :) This post contains some affiliate links for your convenience. Click here to read my full disclosure policy. 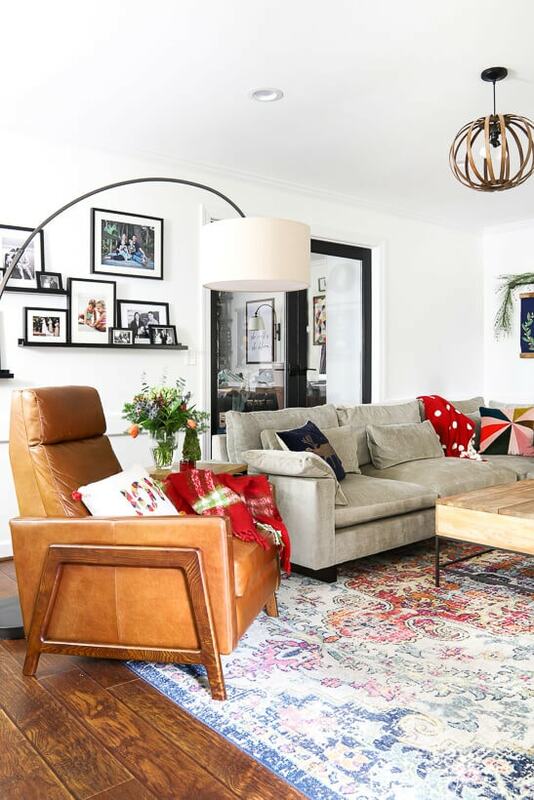 Let's start in our family room, because it's my favorite! 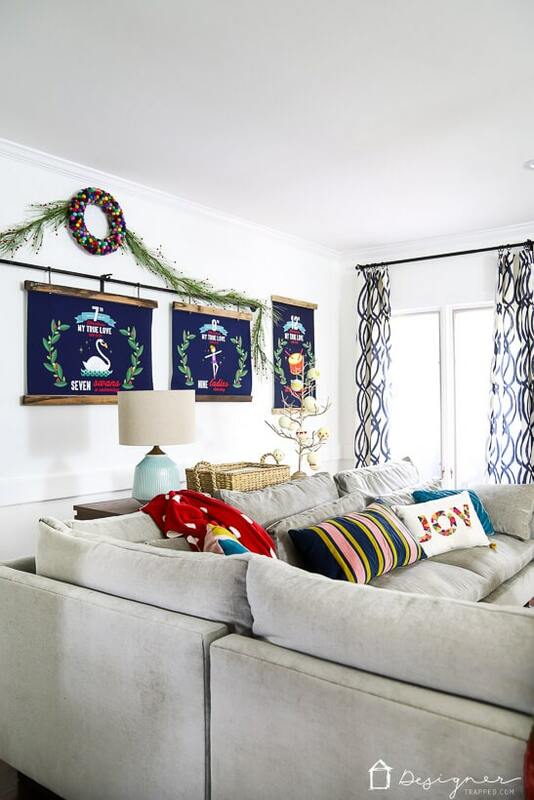 For sure a big feature in our family room are those velvety, navy blue 12 Days of Christmas prints. 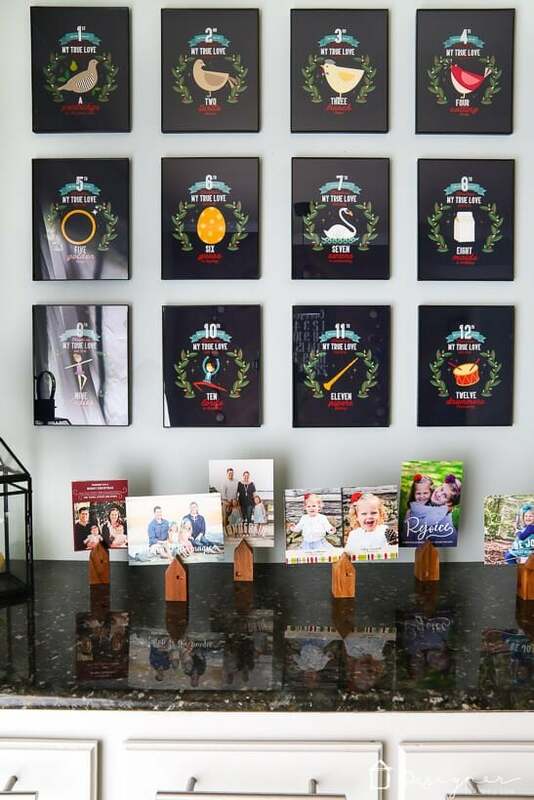 They are hanging from our DIY frames & pipe creation that we made from some reclaimed wood. Above the prints we hung the DIY felt ball wreath that I made earlier this year, along with some simple garland. 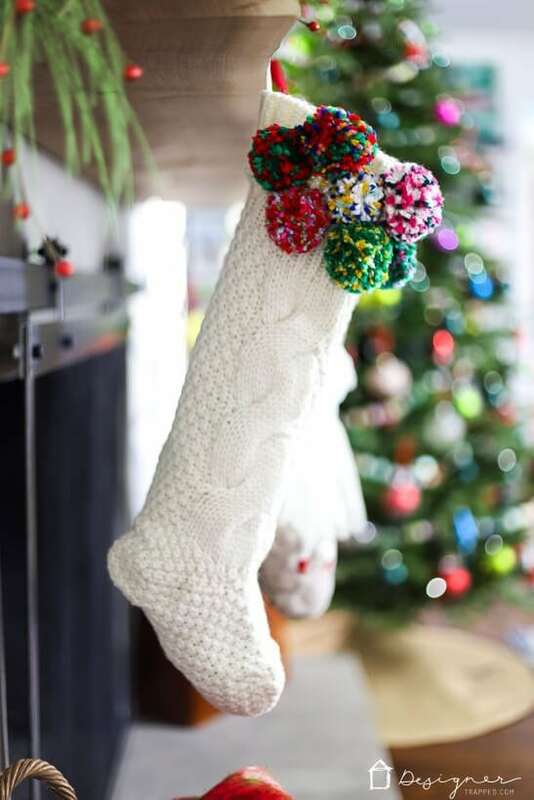 I'm super in love with the new pom pom stockings I made (tutorial coming soon), as well as that fun felt “Merry Christmas” garland I found this year. And I can't say enough about the velvet throw pillows on the couch. 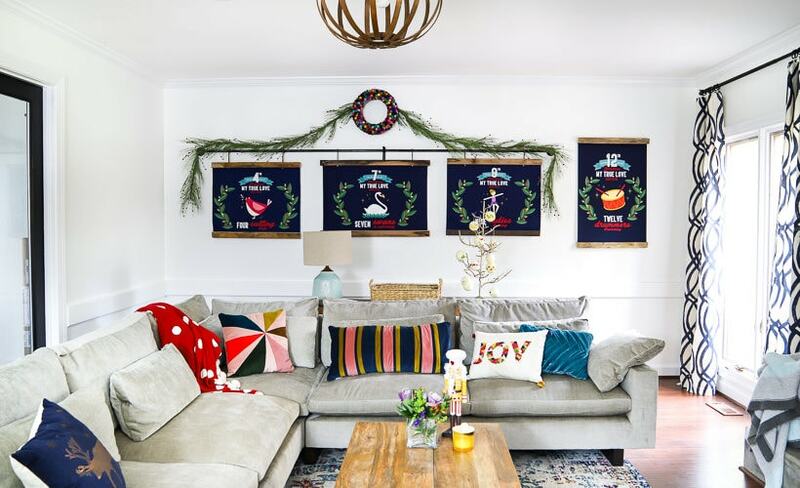 They aren't meant to be Christmas pillows, but they work perfectly in this room. Click to the arrows to scroll through. 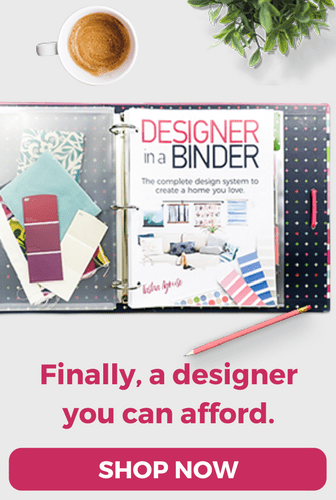 Click on any image for full product details. 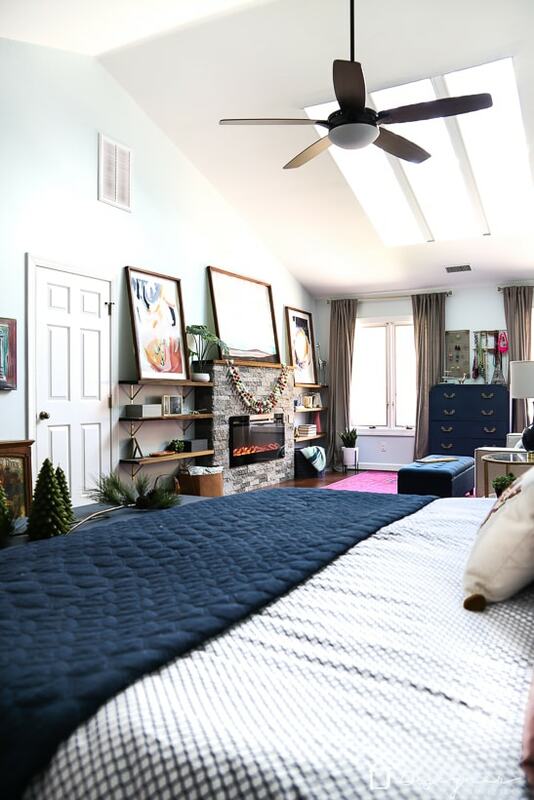 Alright, now let's head to the master bedroom because it's my second favorite space. 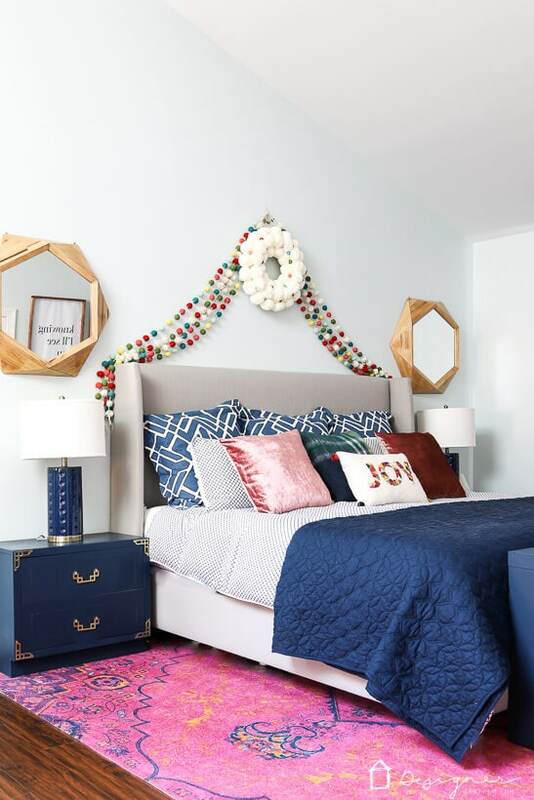 This is the first time we have ever done anything for Christmas in our bedroom. We didn't do much at all, but the little bit we did makes it feel so fun and festive! All we did was add a wreath, some pillows, felt ball garlands, candles and greenery. So simple and easy! Next, let's head into our foyer. 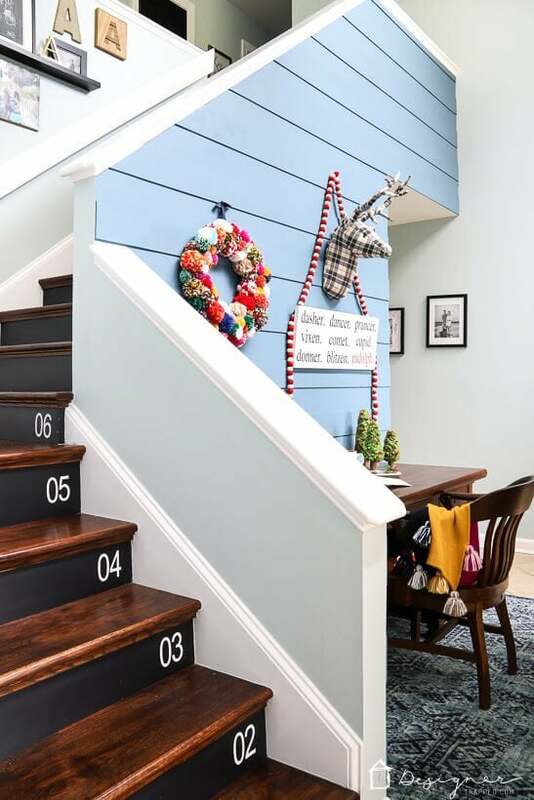 Our brand new DIY plank wall is looking fun and Christmasy! We kept the decor simple. 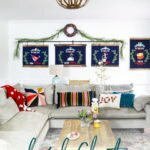 I hung our DIY pom pom wreath and our DIY reindeer sign, along with a simple red and white felt garland. And this is the spot that I chose for my very favorite plaid stag that we've had for several years now. Next let's peek into the dining room. We kept things simple in here. 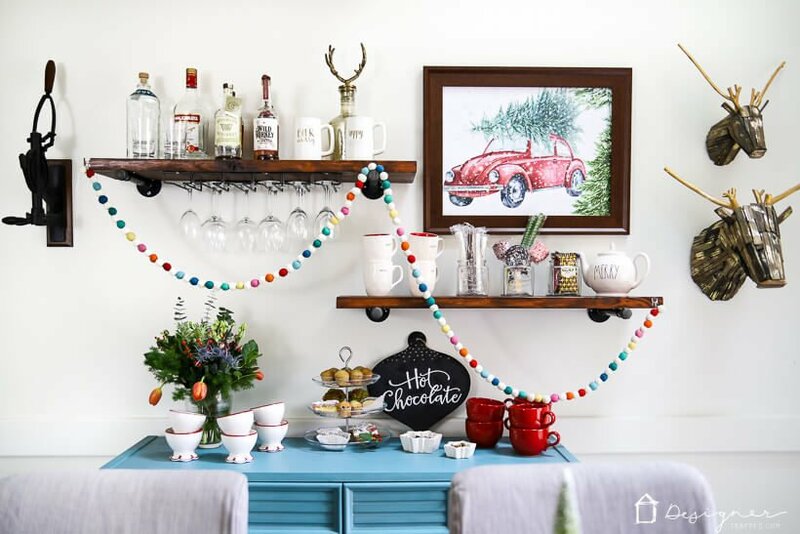 Most of our attention was spent on the bar area that we created with our DIY pipe shelves, where adding a colorful felt ball garland and this Christmas print made it feel Christmasy without a whole bunch of effort. 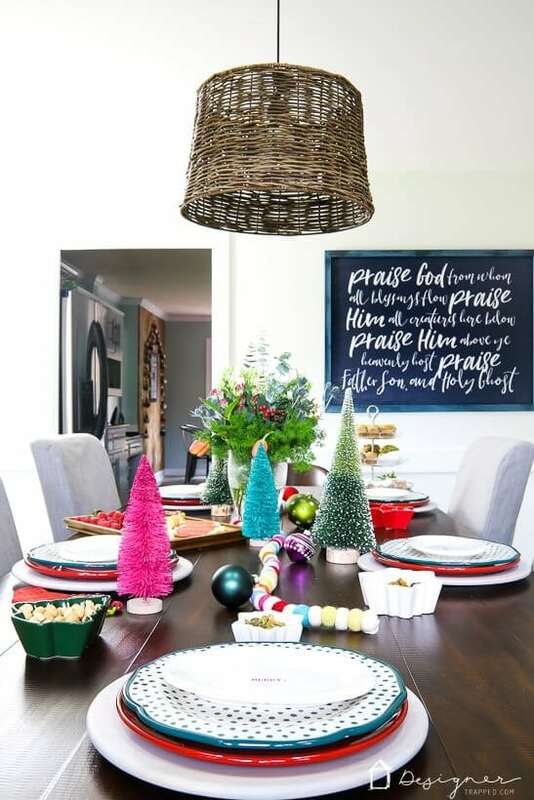 Other than that, we just brought out our Christmas dishes and some bottle brush trees. Alright, now it's time for the kitchen. I've never really done much Christmas decorating in our kitchen because it's definitely our least favorite room in the house (even after we painted the outdated cabinets without priming or sanding almost 5 years ago). But I do love it a bit more now that it's decked out for the holidays! 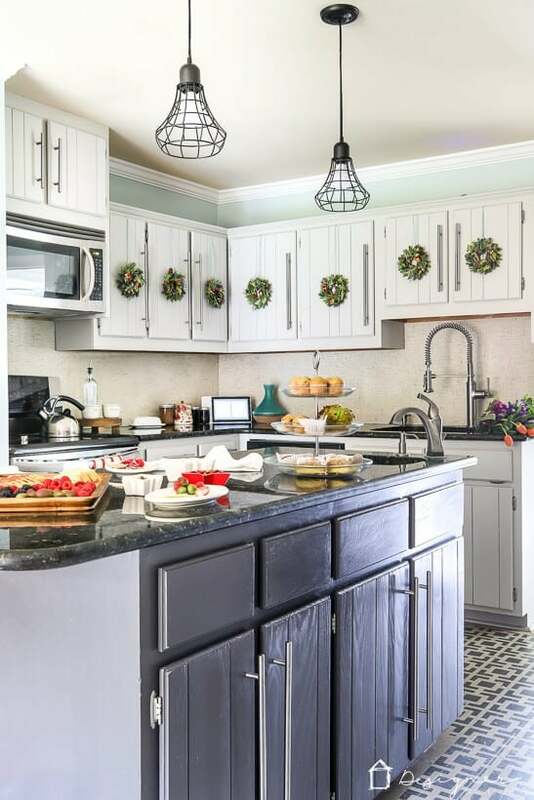 The addition of the little wreaths on the cabinet doors is my favorite part. I added some colorful felt balls to them just to add a bit more color and dimension. And of course, I love my full 12 Days of Christmas print set on the wall. 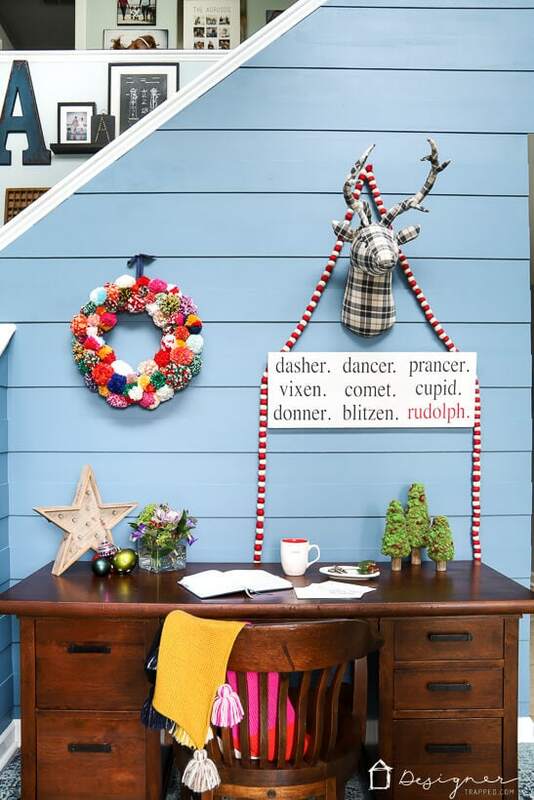 Such a cute and affordable way to decorate the area by our back door and garage door for Christmas. 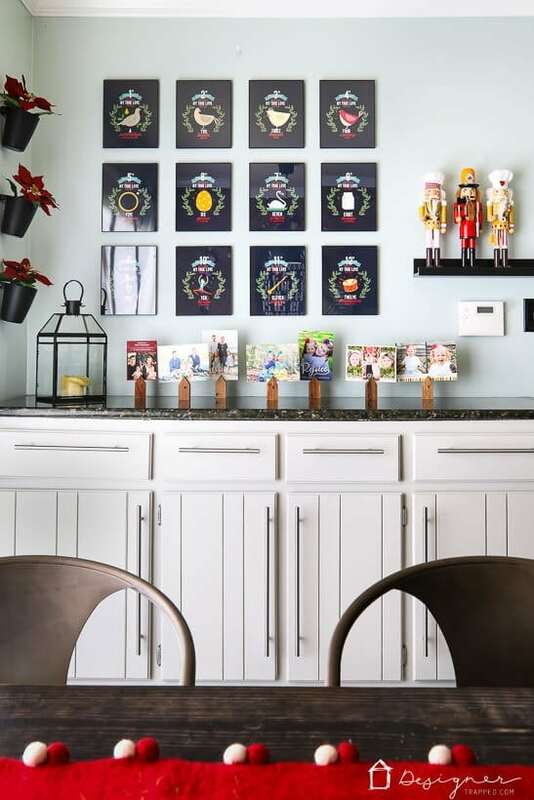 This is also the area where we display all of our past Christmas cards. We just pop them into these place card holders. So simple and cute. 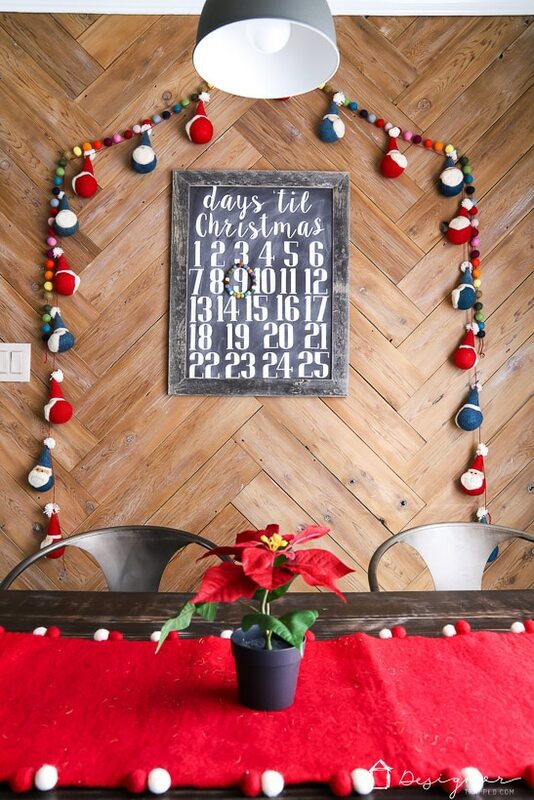 And we are displaying our DIY countdown to Christmas wall hanging in our breakfast nook. 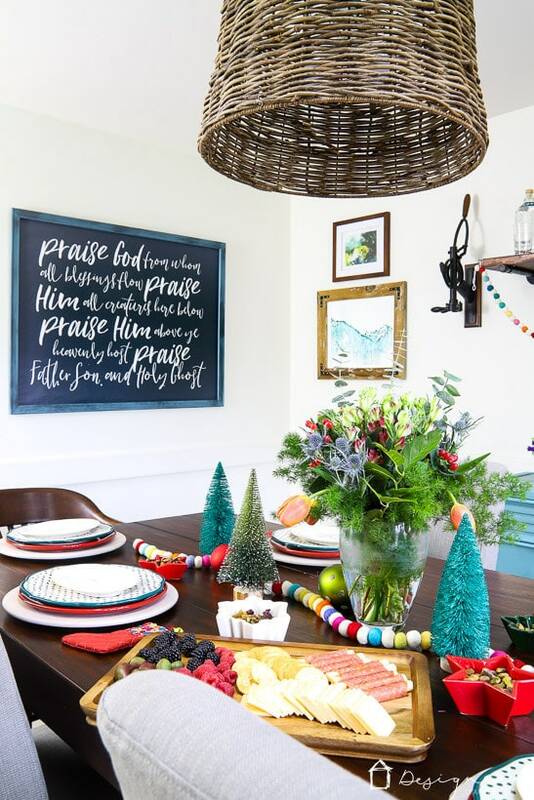 I found that adorable felt Santa garland last year and added a more colorful felt ball garland just to add some more color to the area. Phew! 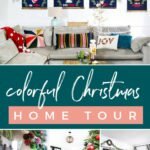 I know that was a lot of photos and information, so if you've made it all the way down here, THANK YOU for taking my Christmas home tour. I hope you enjoyed it as much as I've enjoyed sharing it with you! And I wish you the happiest of holidays! Now, how about a free gift before you head out? 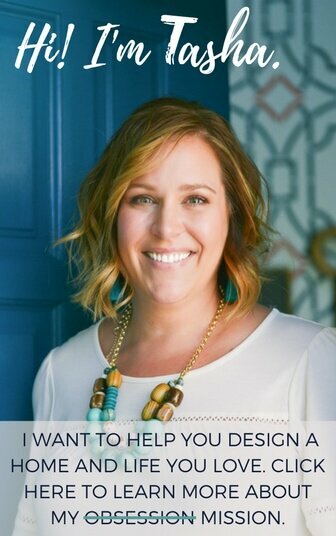 Grab one of my absolutely FREE design guides! 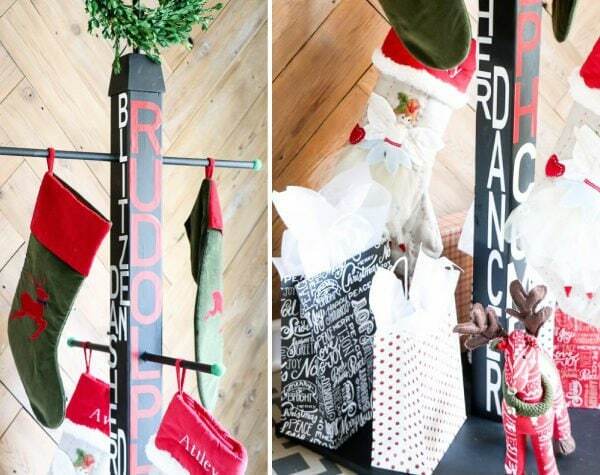 DIY Stocking Holder Stand: No Mantel? No Problem! 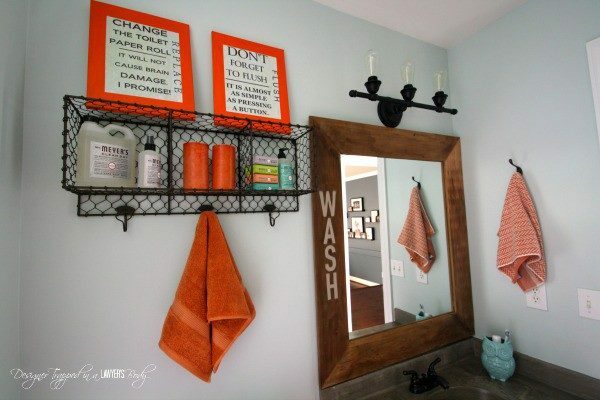 Powder Room Reveal full of awesome powder room ideas! 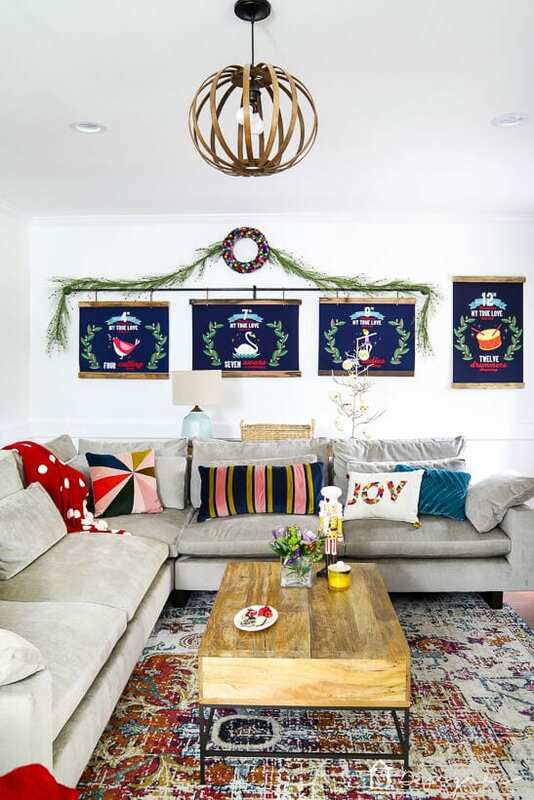 I’m normally very traditional with my Christmas colors, but I LOVE the pops of color in your Christmas decor. 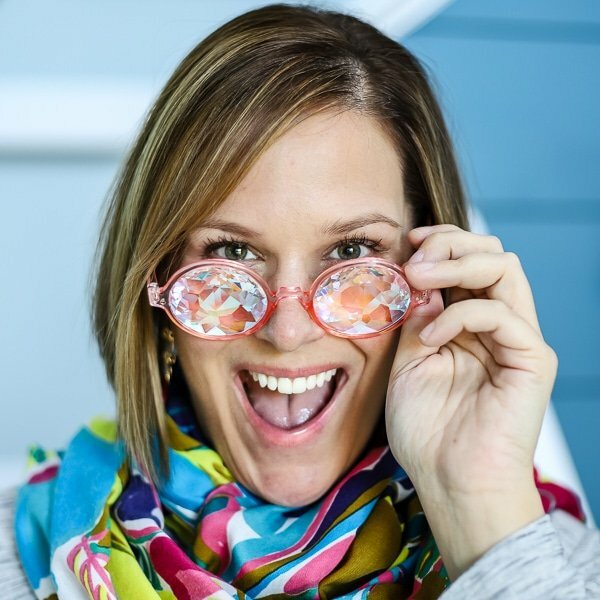 I also love how you don’t over do it…but do it just enough! Very warm and inviting. 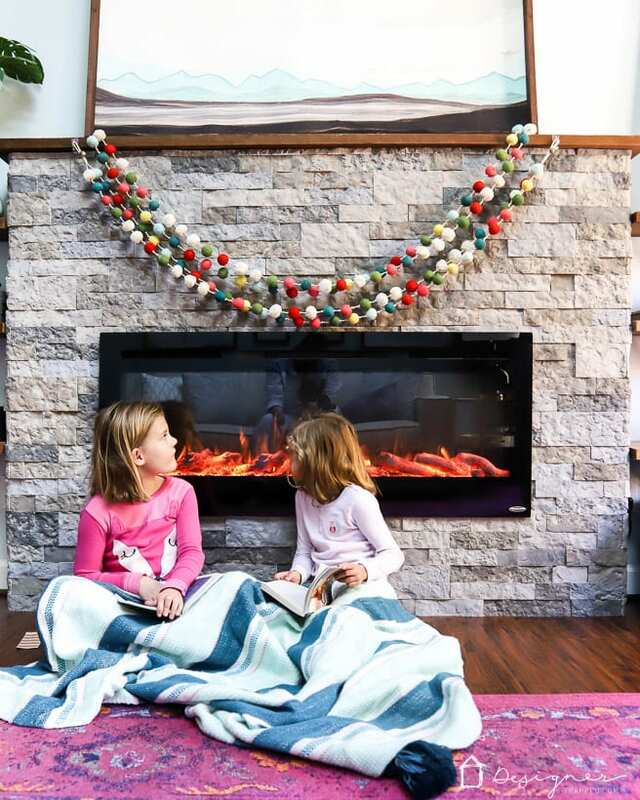 Thank you for sharing your beautiful Christmas home! Happy Thanksgiving and Merry Christmas! Awww, thank you so much Michelle! I hope you had a fabulous Thanksgiving and that your Christmas is wonderful!